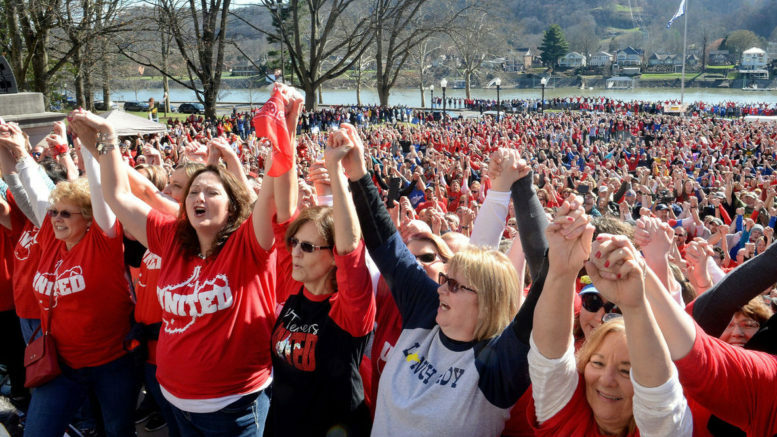 West Virginia teachers continued their strike for an eighth day on Monday after the state’s Senate unraveled a plan over the weekend for a five percent raise. Colette Luke has more. West Virginia public school teachers will strike for an eighth day Monday because the state legislature didn’t meet their demand for higher pay and better benefits over the weekend. Union leaders say the teachers won’t return to work until they get a 5% raise. It’s not known when the committee will meet, so it’s possible the strike could stretch out for days. The waiting frustrates parents, students and union leaders, who’ve marched and crowded the state capitol for legislative hearings. Danette Fulton, a special education teacher from Harrison County, said she’s eager to return to the classroom. Legislators have defended their actions. Three members from the House and three from the Senate — two Republicans and one Democrat — were selected. The group will have three days to come to a decision about the bill. A brief period of confusion occurred Saturday night after the Senate believed it had voted for the 4% raise. But a House version of the bill, which favored the higher pay raise, had somehow been entered into the Senate voting system and was approved by unsuspecting Senate members. When the error was discovered, the Senate corrected the mistake and re-voted for the lower pay raise. Polo Sandoval contributed to this report. Posted in Advocacy, Educators Protest, Funding For Education, Pension & Salary and tagged "Standing Strong for Public Education", #iBelieve, Accountability, Advocacy, Diversity, Education, Equity, Failing Schools, Pensions, Public Education, School Choice, Students. Bookmark the permalink.